MapIt is a GIS app designed to support GPS data collection and any kind of GPS / GNSS based surveys. It’s a mobile GIS tool for land and field surveyors and anyone dealing with environmental and GIS data. MapIt makes GIS data collection or field survey process faster and more efficient. App can be also used as a measurement tool to calculate areas or distances. The data can be organised on layers and exported to number of common formats. When registering location simply choose required attributes from defined drop-down list, no need to type the same information over and over again. Import long list of attributes from text files and re-use them in number of projects. If necessary you can add pictures to each location as well. If you are working in the field, gathering large amount of spatial / location based data this app is designed for you. MapIt is a perfect app for anyone involved in forestry, agriculture, environmental or farming business and allows quick collection of spatial data without the need of typing similar information number of times. Speed up your workflow and make the data collection more efficient. Take advantage of survey layers and possibility to re-use same set of attributes for multiple surveys. Export your data to common GIS formats like Esri shapefiles, CSV, KML, GeoJSON, ArcGIS JSON, DXF, GPX and post process your data using Desktop GIS software like ArcGIS, ArcGIS Online or qGIS. The purpose of the survey is to gather the trees distribution in public park including the height of the trees. To add new fields ‘Species’ and ‘Height’ we need to edit the attribute properties. Please choose the name of recently added item and then click the ‘Pencil’ icon from the context menu. We can also add so called ‘Scalar field’ it will be display as a free text or Yes/No spinner on the ‘Add feature’ screen. At this point the attribute set is ready to use. 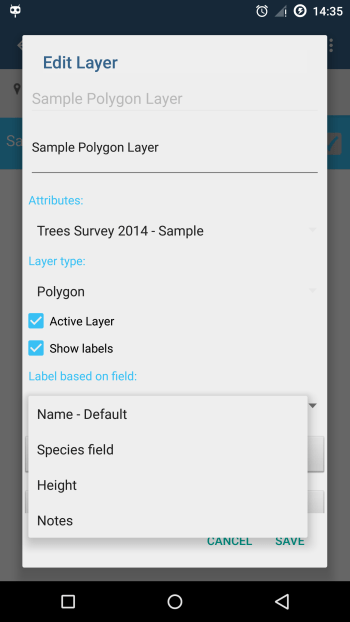 To start the survey we need to create the survey layer now and set the default attribute set. To add new layer and use it to collect the survey information please go to ‘ Layers’ Management’ and press ‘Add Layer’ button. Set the default attribute set – if you leave it as ‘None’ you will be able to create points containing only name and description. You can also choose color for new markers or lines or set outline color and fill for polygon geometry type. Please set the layer as Active to be able to add new features to it. When there is an active layer each time you press the ‘Add Point’ button when collecting the data you will see screen containing dropdown lists for preset attributes. When the survey is finished you can export your data to CSV, KML or GeoJSON format – exported data will be saved to SDCard and alternatively can be shared using number of standard ways including email, gdrive and skype. – Support for WMS and ArcGIS Server Tiled map services as Google Maps Overlays (Load topographic and orthophoto maps, geological surveys, cadastral information and number of other services. – The app supports number of predefined coordinate systems like: WGS84 (decimal or degrees), Web Mercator, British National Grid, UTM SAD69 (Brazil), UTM NAD83, NATO, Stereo 70 (Romania), System 1992 (Poland), UTM Indian 1975 (Thailand), SIRGAS 2000 UTM coordinate system for South & Latin America, ETRS89, TM06 – Portugal, D73 Modified Portuguese Grid or custom EPSG code can also be used if required.